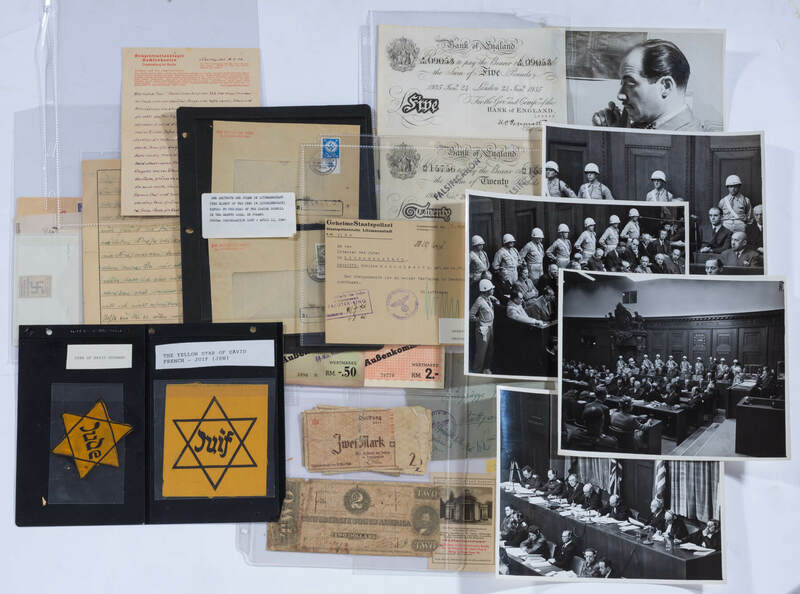 A wide collection of over 100 documents, photographs, medals, letters, ghetto currency and coins, personal prosecutorial notes, etc assembled by one of the prosecuting attorneys from the nuremberg trials of nazi war criminals. 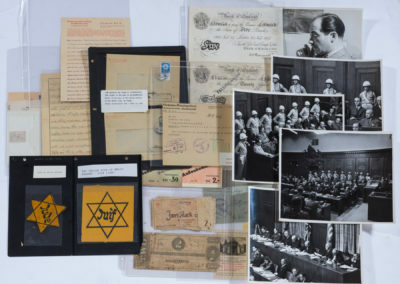 Also included are various newspaper clippings, israeli stamps and first day covers, original photographs of the trials in action, and original photographs with moses kove pictured with david ben-gurion, golda meir, jimmy carter, gestapo arrest warrants, nazi stamps and other third reich related documents, original yellow stars of david from germany and france worn by inmates, letters from mauthausen, polish postal stamps, kove’s curriculum vitale, as well as non-related items such as a two dollar confederate bill with judah benjamin. 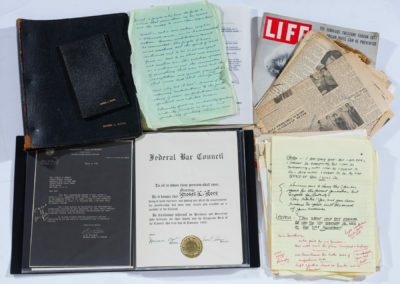 There are also several documents related to bnai brith during the time that mr. Kove was a chairman and his original resignation letter to mayor abe beame as the chairman of the taxi and limousine commission. 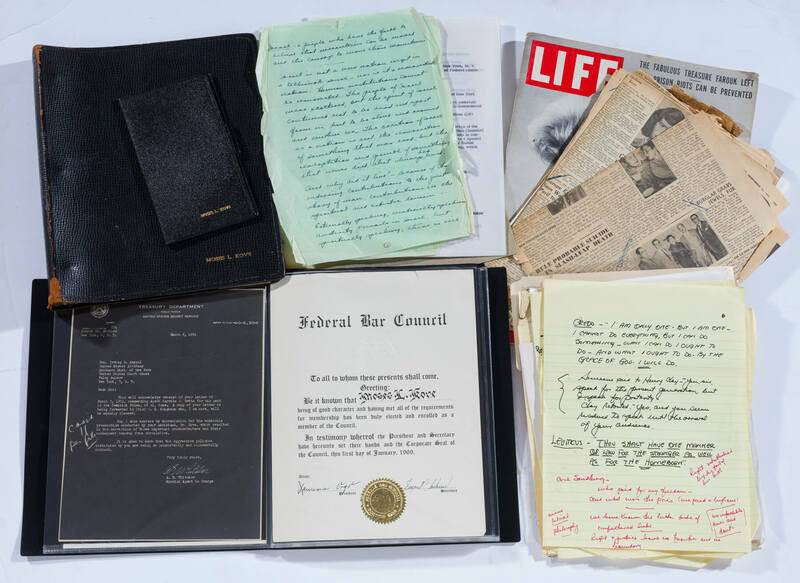 There are several government letters including one from the treasury department praising mr. Kove’s prosecutorial skills in attaining the conviction of counterfeiters in 1951. The lot also includes several badges and medals including the chairman of the city of new york taxi and limousine commision, the magistrate of the town of fallsburg, an honorary key to miami beach given by then mayor chuck hall, adl 50th anniversary medal, the liberation of israel 1948 medal, city of new york deputy inspector badge and a jnf/kkl copper medal. Moses l. Kove, esq, was an assistant us attorney for the southern district of new york, assistant attorney general for the state of new york, magistrate of the town of fallsburg and most importantly a war crimes prosecutor in nuremberg, germany who was in charge of the investigation of complicity of the directors of i.g. Farben chemical combine in the use of slave labor and medical experiments in the concentration camps. During his tenure at nuremberg, he was a special observer for the united states government at the trial of rudolf hoss, the commandant of the auschwitz concentration camp whose trial took place in warsaw, poland. (hoss was found guilty and executed april 16, 1947). Consigned by his family.